Are you ready to begin? I'm really excited about the Pretty Peplum Top Sew Along and seeing what questions you have and how your tops turn out in the end! We will be covering each step in this sew along as well as modifications, tips and other ideas for this peplum top from Pamela's Patterns. Pamela will also be on hand to answer your fit questions! So let's get started. Some of you may already have this step taken care of, but there may be some of you that need some guidance. This pattern calls for a good quality knit fabric. Pamela also gives a tip for making sure the fabric snaps back into place. This means it has to have stretch. 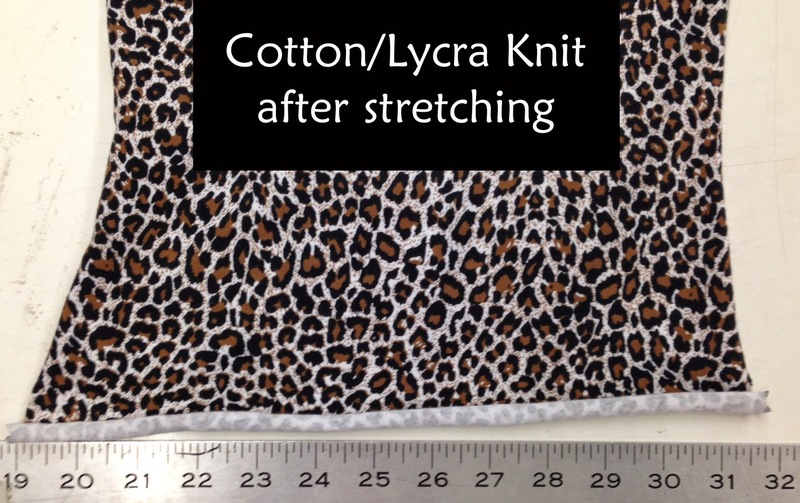 When someone says "stretch" knit what does that mean? Mostly all knits stretch, but do they recover back to their original state? If they do, then they have spandex, lycra or elastine. 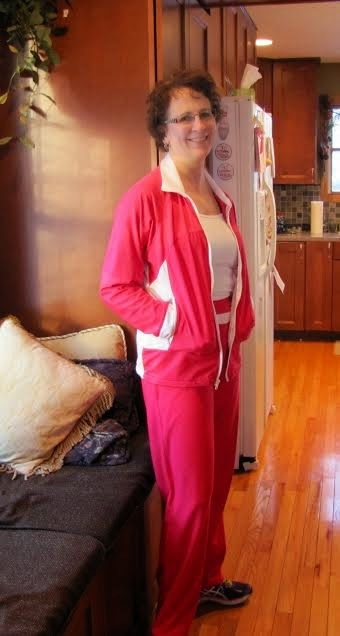 (Lycra is a product and trademark by Dupont Company.) There is no technical difference between spandex, lycra or elastine. If you want to learn more about that, here is a good article about that. Notice that I always have the left side lined up with 19" mark. As you can see with this particular fabric, the fabric was stretched and left go. It "grew" about an inch and did not recover. These fabrics usually will come back to position after being washed. 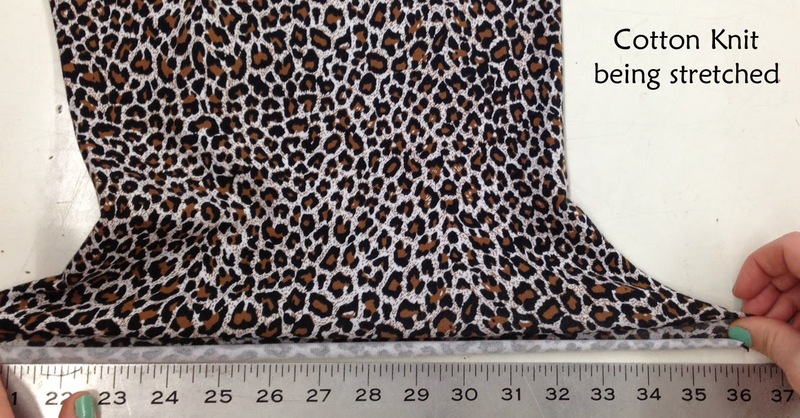 Here you can see that the fabric was stretched but that the before and after photos measure the same. 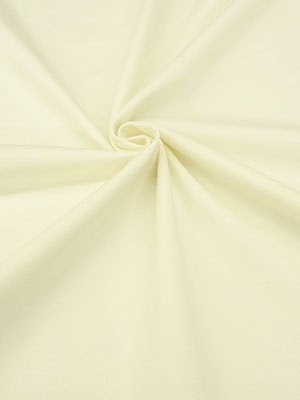 That means this fabric would be suitable for this pattern because it has good stretch recovery and will not grow as much as a 100% cotton/poly/rayon/etc. knit. I would recommend any light or medium weight knit for this pattern. 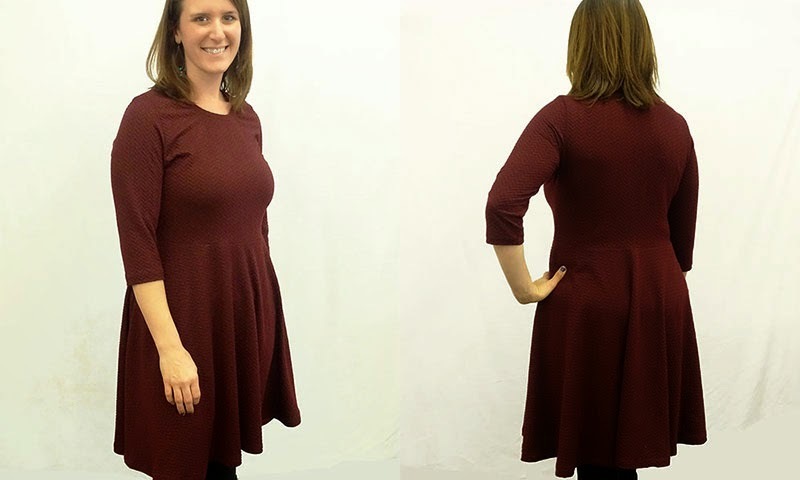 I would not go much heavier than a ponte knit with some drape, because something that does not drape well will not create a nice, smoothing peplum. A stiff knit will create a peplum that stands out more like a tutu! 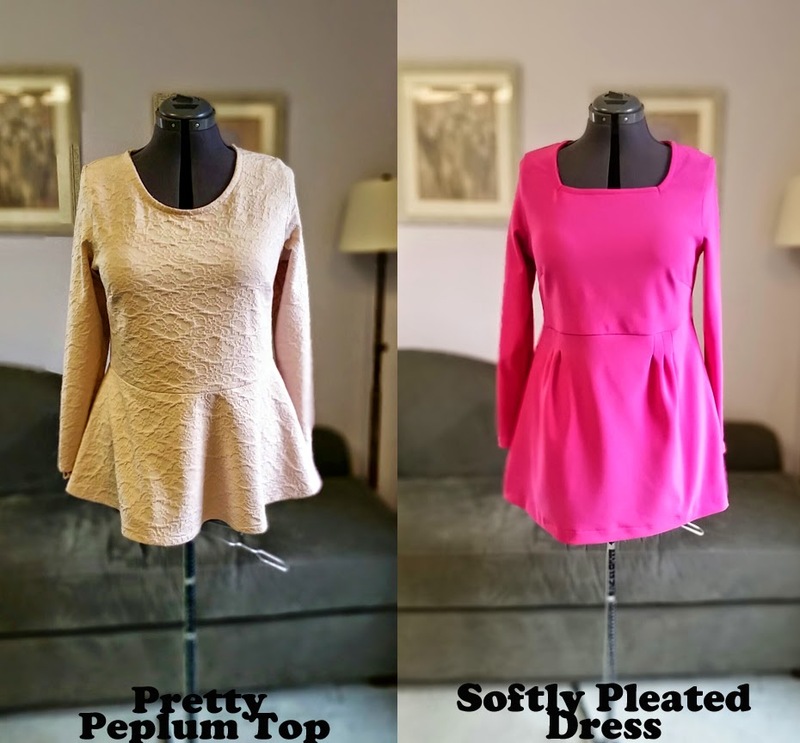 I used a few different kinds of knits for the various peplum tops I created. 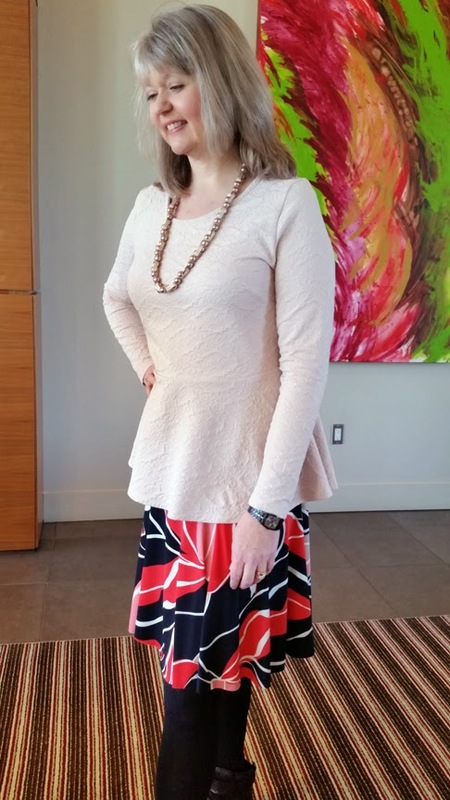 I used an ITY knit, a jacquard double knit and a ponte knit. 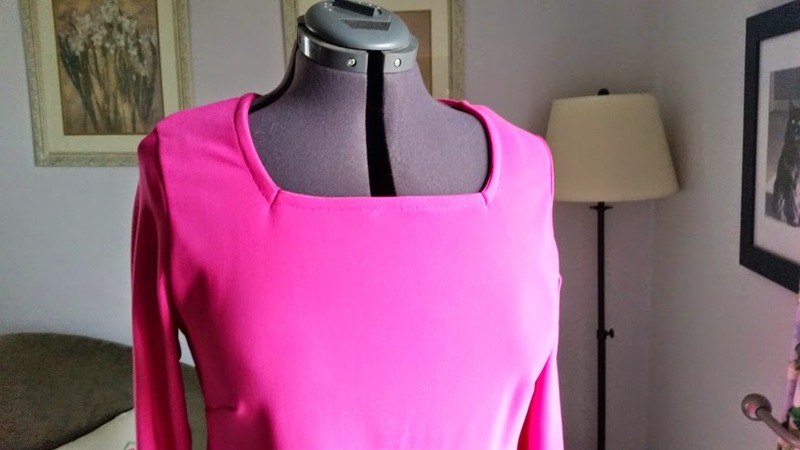 An ITY knit is a lightweight jersey-like knit that is good for tops, skirts and dresses. I use ITY knit all the time and it comes in a lot of pretty prints and solids. I always think the photos showing the twist really help me visualize what the fabric would feel like. LIghtweight knits usually have small folds and that is evident in this photo. See all ITY knits we carry HERE. A ponte knit, jacquard double knit or any other double knit with stretch would also be good. This type of knit is a light-medium weight so it will have a little more body than any ITY or jersey knit. Again, look at the folds. If they are big folds, this may be too stiff for this pattern. See all Ponte knits HERE. The white fabric is a stiffer ponte than the tan fabric. You can tell this because of the flowiness of the folds in the tan versus the white. The white folds are much more structured. Of course if you want a structured peplum top, this could work for you! Other knits that could be used are: rayon or cotton jersey knits, cotton interlock. I would not recommend a really lightweight or sheer jersey knit because they usually do not have a nice stretch and recovery factor. While I'm not sure I would make this pattern from a lace or mesh, it probably could be done! But I would recommend finding a lace or mesh with ample stretch. See our entire knit collection HERE. So now go pick 2 1/4 yards of your choice fabric and get it washed! I ALWAYS pre-wash my fabric before cutting. I actually wash the fabric before it even makes it to my sewing room, so I always know that any fabric in my sewing room can be used. No guesswork! Then I'll see you next Friday with our first step...cutting out the pattern! I'm always a little perplexed when it comes to making alterations to patterns, and Pamela's Patterns advertises that their patterns already include the most common alterations, including high round back, forward shoulder, full bust option, extra hip/tummy room and a great fit in the neck and shoulder. That sounded good to me! For both patterns, the first step- picking your size-asks you to choose your size based on your high bust measurement. Each pattern has two front pattern pieces- one with a dart, and one without. If there is more than a 3" difference between your full bust and high bust, she suggests using the darted front. So, since my difference was right at 3", I decided to use the darted front for both. The pattern suggests good quality knit fabric, and emphasizes that you should stretch the fabric and make sure that it bounces back to its original length. If it doesn't, she says, don't use it. I chose two double knits from Fabric Mart- one was a cream lacy look, and the other a bright rose. Both of these were firm knits and had excellent recovery after stretching. The pretty peplum top has both long and cap sleeve options, and a keyhole or scoop neckline. I chose the scoop neckline with the long sleeves for this top. The Softly Pleated Dress pattern includes a crew or square neckline, long or cap sleeves, and three different length options. 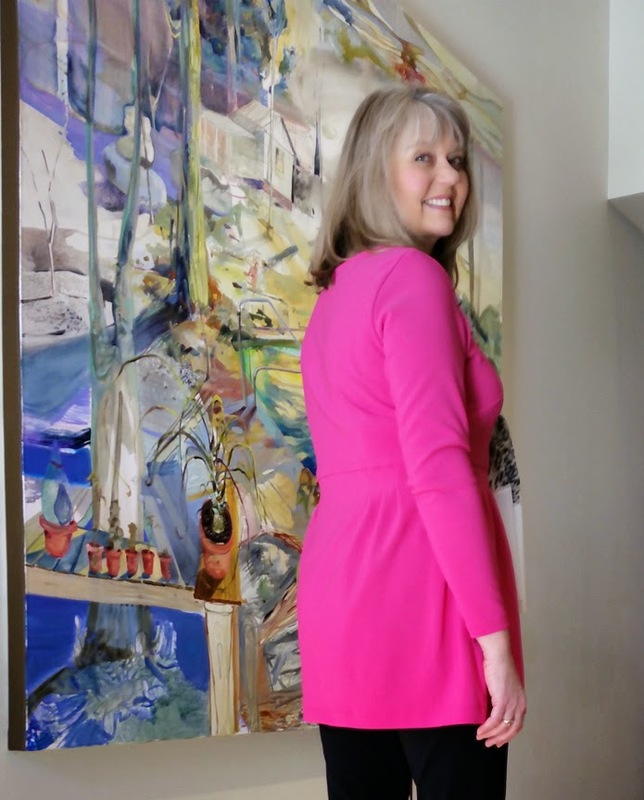 I originally made mine the longer dress length, but it was way too much pink! So, I shortened it to the tunic length. It's still pretty bright, but it should brighten up a drab winter day. And this is what it looks like from the inside. You just make a tiny dart at the edges. My fabric is a little too thick to flatten it out, but ideally, you would press these tiny darts flat. The directions encourage you to use Stay Tape for thinner, drapier knits, which would be a fantastic idea. These particular knits were quite firm, so I skipped that detail. 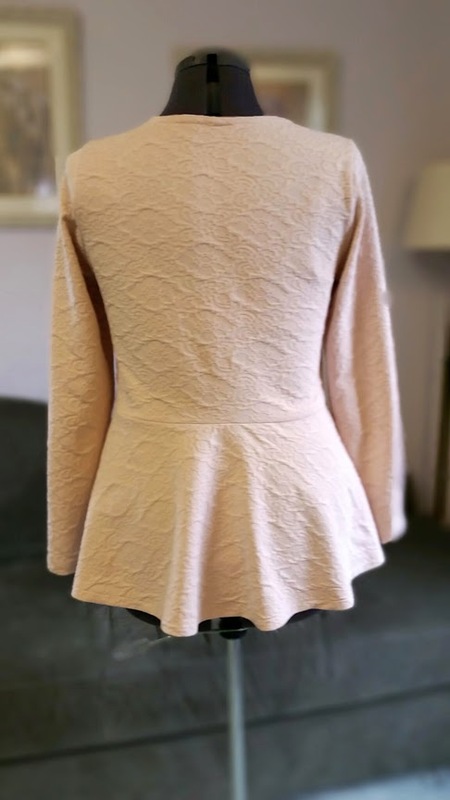 The back of the Pretty Peplum Top truly is pretty! The peplum is not too full- just enough fullness to give you some shape. You can see the back of the Softly Pleated Dress also has pleats to add a little back interest as well. 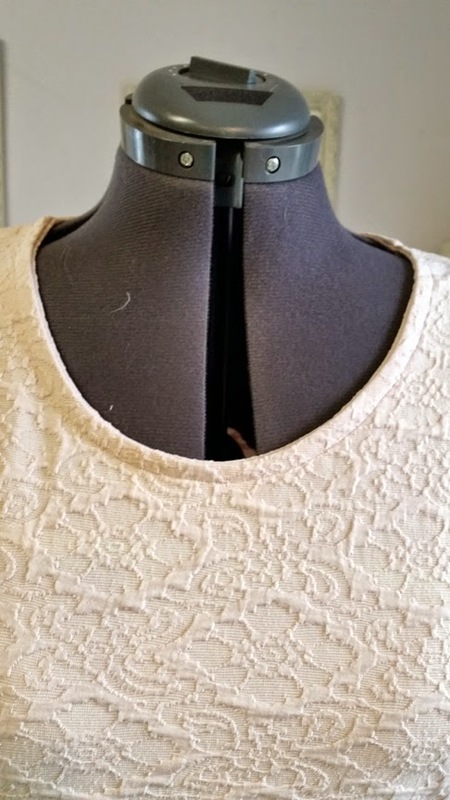 I liked the method Pamela has you finish the necklines on both tops. You press the seam allowance of the neckline seam towards the band, and then fold the raw edge of the band back over the seam allowance and stitch "in the ditch". This gives the band a little filler so that it stands out more. You then trim off the excess binding close to your stitching on the wrong side. I made one change on the Softly Pleated Dress, and that was to add pockets. I love having pockets to carry my phone. 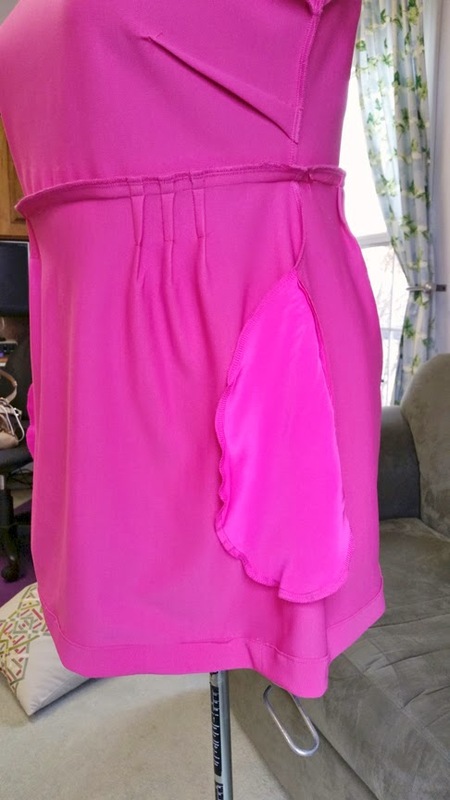 I didn't want to use the double knit fabric for the pockets in case it would be too bulky, so I found a similar colored silk twill and just used an inseam pocket pattern from another dress. I placed the top of the pockets three inches below the waistline seam in the side seams, and it is just right. You can see them from the inside here, as well as how the pleats are sewn in place. 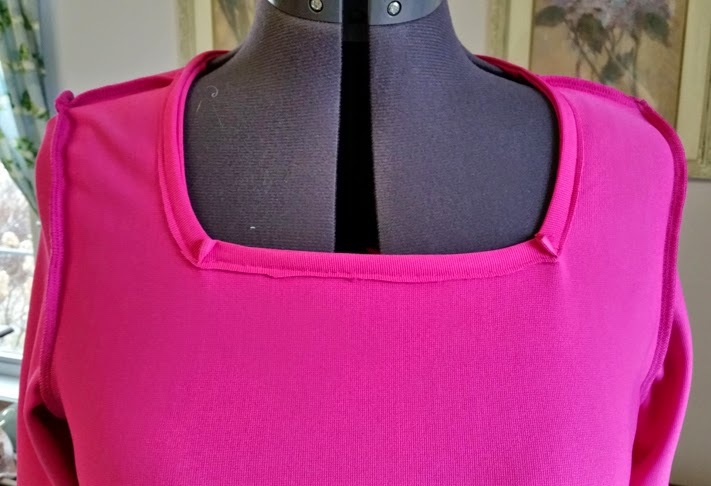 Pamela also has You Tube fitting videos on these tops to guide you in making any adjustments to fit your own shape. I liked where the waist hit me on both of these tops, so I didn't change it, but she recommends basting in these seams until you can try them on and look in the mirror to check the fit. I'm getting a small fold right above the bust on the Pretty Peplum Top, which Pamela suggested might be because my armhole is too long. She does include shorten/lengthen lines on the front, back and sleeve for this alteration, so I will try that with my next version. Overall, I'm really happy with both tops! I think there are many great possibilities with both patterns, and can see using them quite a bit in my future sewing! Happy New Year Friends! I'm happy to get my Fabricista year off to a good start with a classic boucle jacket. 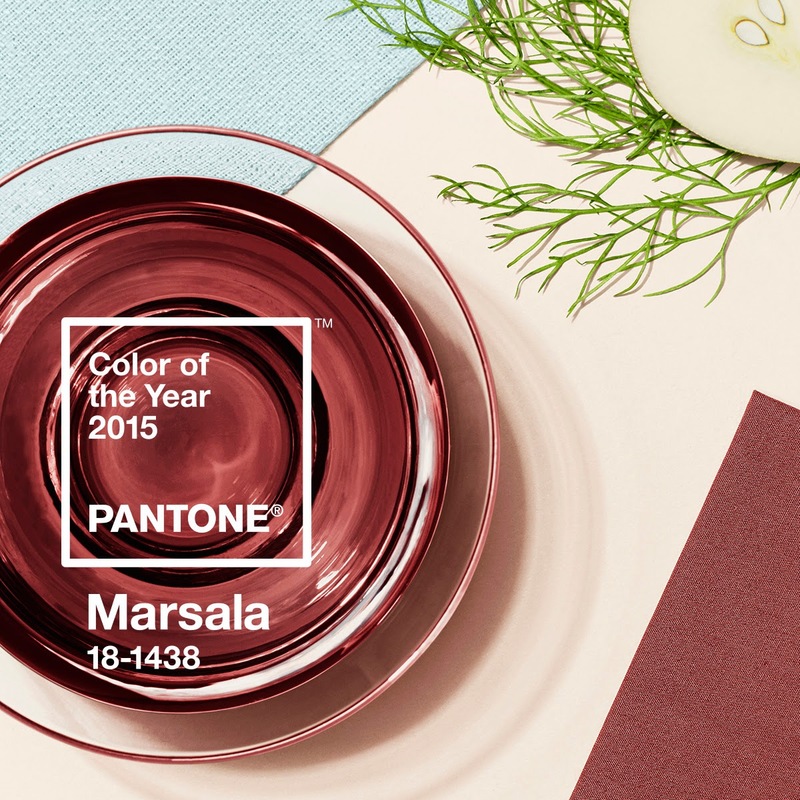 It's a timeless style, classic fabric and beautiful color! 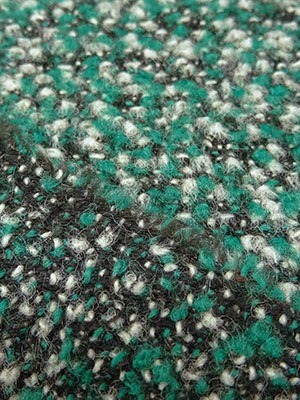 I started with New Look pattern 6028 view A and chose Fabric Mart's soft green, black and white boucle suiting, similar to the type of fabric used in the pattern photo (the fabric also comes in this pretty pink, yum!) I used this Maggy London black satin for the lining. So luxurious! 1) I added 1" to the hem of the jacket shell (there was only a 5/8" seam allowance). 2) I cut the jacket front facing out of the shell fabric. 3) I cut a back neck facing out of the shell fabric and attached it to lining. Trace the sleeve head onto lightweight fleece, from dot to dot. Draw a line from dot to dot. Sew the sleeve head onto the seam allowance of the sleeve, matching raw edges of fleece and sleeve. Stitch just inside stitching line (4/8"). Press all seams toward the sleeve. The sleeve on the left has a sleeve head and the one on the right doesn't. You can see what a big difference this tiny piece of fleece makes. The one on the left looks much better, it even makes the side of the jacket hang more smoothly. And this is all before shoulder pads! And now for the fun part....the trim! The outer trim on the jacket is simply bias strips of fabric gathered down the center. I used the gathering foot on my machine, set the tension all the way up, used the longest stitch length and stitched until everything was gathered. I put the trim on with a straight stitch right over the gathering line. Super easy....and pretty! I had some leftover strips so I sewed them into a continuous circle, put a button on top of the raw edges and made a flower. I'm feeling pretty tricky right now! I think now it's time to make this jacket in pink! Every year I vow to get in shape and stay in shape. Typically, I do really well with this promise to myself up until about October. Then it seems like busyness, apathy, and life just gets in the way and I backslide into old habits...including not working out! So to start 2015 out right, I decided the best and most appropriate thing to do is make some workout clothes I will look forward to wearing and why not? They go together quickly and with this AMAZING fabric I choose from Fabric Mart to complete the job, I'll make more! 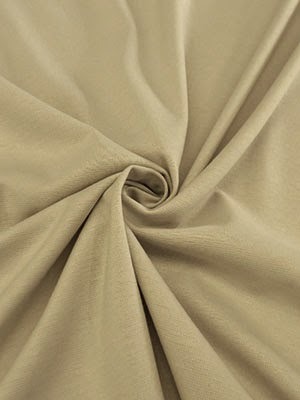 This is a poly/lycra blend and I wish you were able to touch it, it is SO soft! I wish I could wear something like this to work as I think I'd smile all day long! I'd certainly look and feel comfortable. For the jacket I used Jalie 2679, or the women's sport jacket. The details are awesome, the directions are good although a little sparse, and the drafting is perfect. I LOVE this pattern and I am so pleased with my final result! It was fun playing with the layout of the pattern pieces to determine where I would use the contrasting white. For the pants, I used a Kwik Sew pattern that has been in my stash for quite a while. 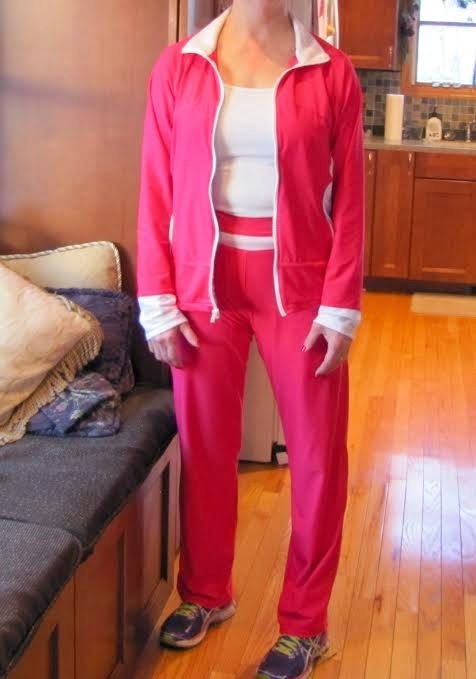 Kwik Sew 3988 has two versions of Yoga/workout pants with a long version with a waist inset, perfect for color blocking, or a shorter version that's knee length that you can make color blocked at the waist seam and outer legs at the knees. 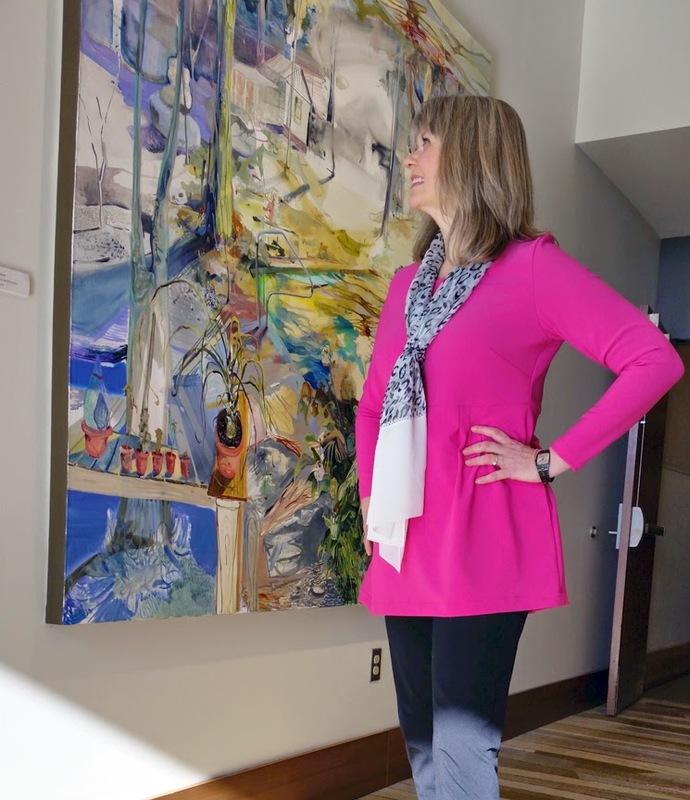 Both views have a gusset at the crotch area--which makes you able to move in multiple ways--even ways you didn't know your body was capable of doing! I LOVE this fabric. It is so soft and I am very happy with the patterns I choose to make this outfit. 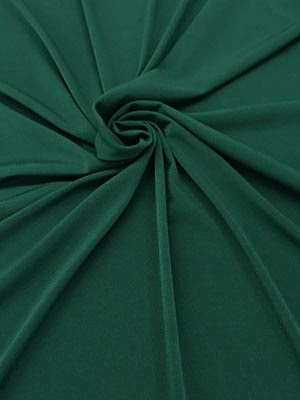 If Fabric Mart has any of this fabric left, don't hesitate to purchase is for any knit garment. It is lovely stuff! Check out their activewear selection here. It is a little sparse at the moment, but you can also check out the swimwear section for 4-way stretch knits that could be good for this project as well. 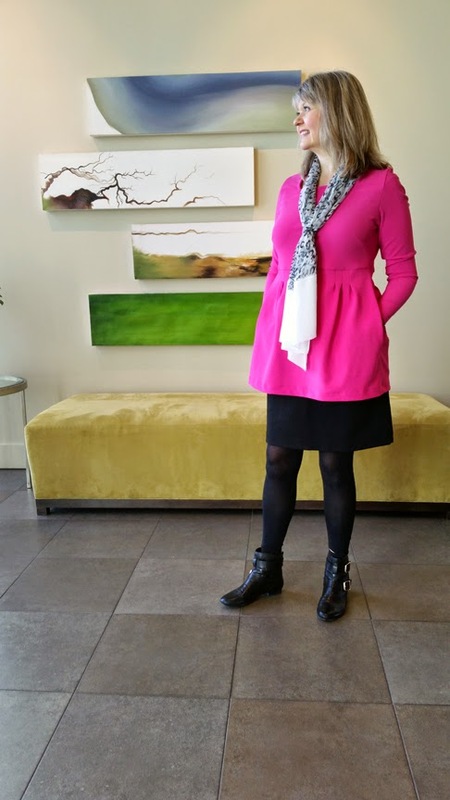 Last year, we hosted a Reader’s Pick Sew Along, where we featured New Look 6097, a knit faux wrap dress. It was a lot fun and had about 12 participants. 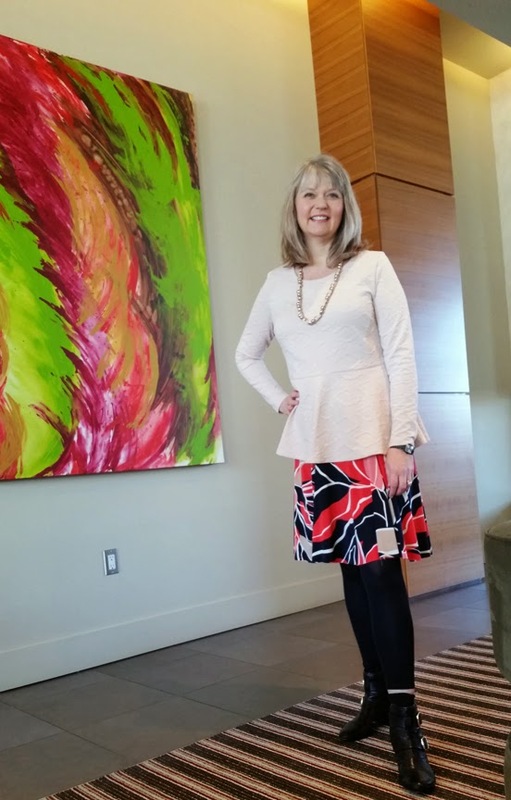 This year, I’m excited to announce that we will be hosting a sew along for Pamela’s Patterns Pretty Peplum Top! You will be sewing along with me as I create the peplum top and additional instructions on how to make it into a skater-style dress. 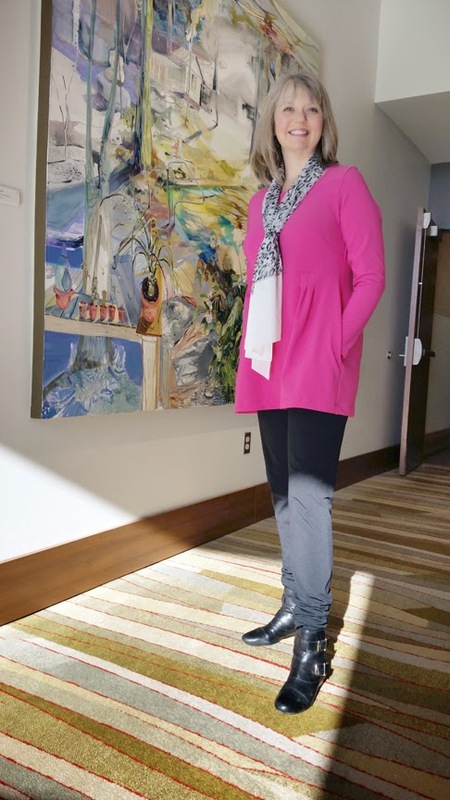 Pamela will also be giving her expert advice along the way too! At the end of the sew along, we will have a drawing for a $100 gift certificate to Fabric Mart AND a $30 gift certificate for Pamela’s Patterns! This will be a random drawing, so all you have to do is submit a photo of your finished top! If you’re interested in participating, email us at fabricmartblog@gmail.com and let us know you will be participating! I'd like to get a head count before we actually get started. The sew along will run through the month of February. The actual sewing time will only be about two weeks, but we will give you plenty of time to catch up and finish your garments before the due date to win prizes! Watch the blog for more details! This should be a lot of fun! I can’t wait to see everyone’s peplum tops!